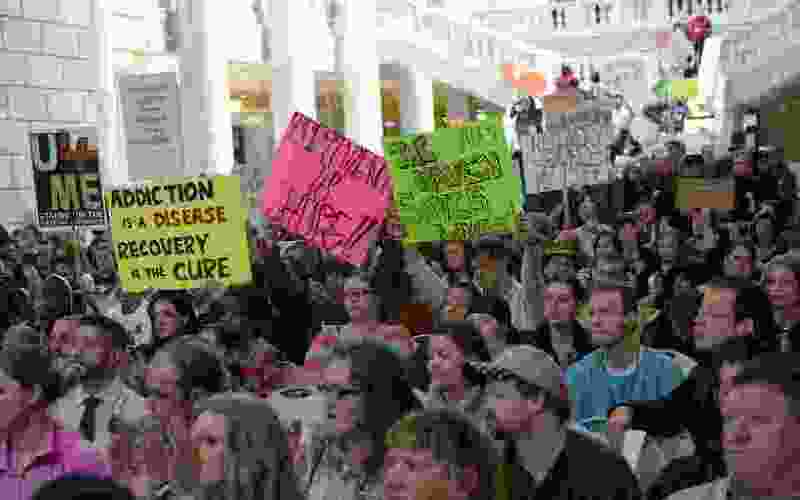 (Al Hartmann | Tribune file photo) Hundreds rallied at the Utah State Capitol Rotunda in 2017 to support Medicaid expansion in Utah. A new poll shows support of a Medicaid expansion ballot initiative continues to hover at around two-thirds of Utah residents. Utahns continue to support a proposed 2018 ballot initiative that would expand Medicaid health coverage to an estimated 100,000 low-income residents. Some 62 percent of Utah voters either strongly or somewhat support the initiative, according to the poll commissioned by The Salt Lake Tribune and the University of Utah’s Hinckley Institute of Politics. Those results mirror the outcome of an October poll; several surveys before that also showed majority backing for the initiative. In the latest tally, 93 percent of Democrats and 51 percent of Republicans said they supported the proposed ballot question, while notably 39 percent of those who identify as “very conservative” are behind it. ”Utahns know where they stand on this issue,” said RyLee Curtis, campaign director for Utah Decides Healthcare, which is organizing the initiative to land the issue on the November ballot. The level of support is identical to an October poll. The numbers also show 93 percent of Democrats and 51 percent of Republicans support full expansion. Organizers continue to gather signatures in hopes of reaching the November ballot. Q: Do you support or oppose a proposed ballot initiative that would fully expand Medicaid in Utah? The poll numbers come as the Utah Legislature considers several Medicaid bills of its own this session — including one sponsored by Davis — after years of minimal action on the issue. Republican leaders have acknowledged the Medicaid ballot initiative is one of two initiatives they hope to undercut before they could go to voters in the fall. Meanwhile, state officials also are waiting on the federal government to approve a waiver that would let them compel able-bodied people to work as a condition for receiving Medicaid coverage. Initiative organizers need to file more than 113,000 signatures from registered voters with the state by April 15 to earn a ballot spot. Curtis said her group is hitting its weekly goals, and people are generally eager to sign, but she declined to say how many signatures have been gathered so far. If passed, the initiative would extend insurance coverage to low-income individuals and families earning too much to qualify for the state’s current Medicaid requirements, but to little to afford coverage under the Affordable Care Act, or Obamacare. Utah is one of 18 states that so far has declined to expand Medicaid under Obamacare. The federal government would cover 90 percent of the costs. To cover Utah’s share, the initiative calls for raising the state’s sales tax rate from 4.7 percent to 4.85 percent. On Capitol Hill, Davis has again introduced a bill, SB47, seeking full Medicaid expansion — for those earning up to 138 percent of incomes at the poverty line. This marks the fourth legislative session the Democrat has tried the legislation, which has been rejected by the Hill’s Republican majority. Davis concedes it likely won’t pass this year, either, but has said it can draw attention to what the initiative could do if lawmakers don’t act. He said Wednesday he’s been informed by Senate leadership that SB47 will be assigned to a committee and he holds out hope a version of the bill could pass the Senate. Davis said he would be receptive to the idea of adding work requirements for the expansion group. Meanwhile, Rep. Robert Spendlove, R-Sandy, is proposing a bill that would partially expand Medicaid coverage, up to 100 percent of the poverty line ($12,060 for an individual; $24,600 for a family of four). He said those above the poverty line can obtain subsidized insurance coverage under Obamacare, so there’s no reason to offer Medicaid coverage for incomes as high as 138 percent of the poverty line. His measure has not yet been introduced. Spendlove said Thursday it will include a work requirement and a cap on the maximum amount the state would spend. He estimated his bill would cover 60,000 Utahns at a cost of roughly $50 million in state money annually; the federal government would cover 90 percent of the program’s costs. Two other notable, but smaller-scale, Medicaid bills also being debated include one to expand birth control to low-income women, including coverage for pricey intrauterine devices (IUDs). HB12, sponsored by Rep. Ray Ward, R-Bountiful, sailed through the House and is working its way through the Senate. Another is HB325, sponsored by Rep. Steve Eliason, R-Sandy, which would expand benefits offered under the state’s Primary Care Network.